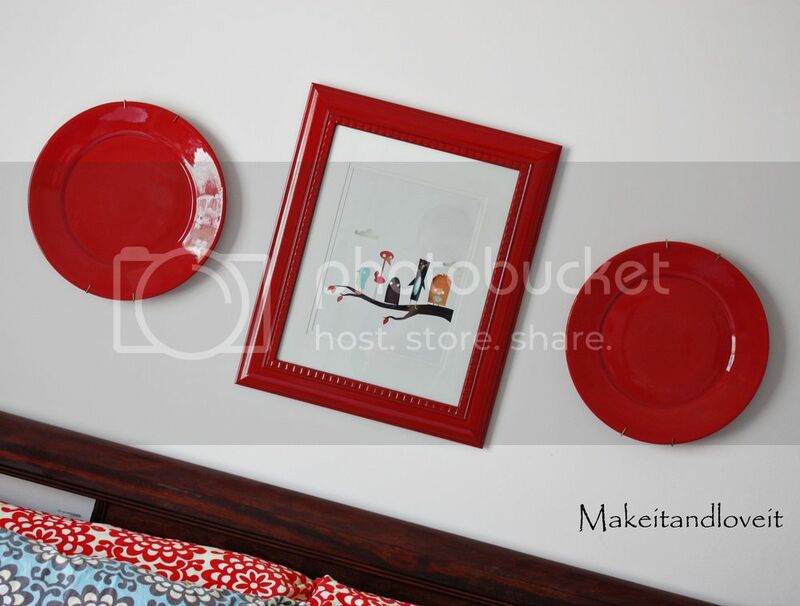 I had a great idea to put plates on my wall……to finish off our bedroom. In a nice and sassy cherry red, to place right above the headboard. 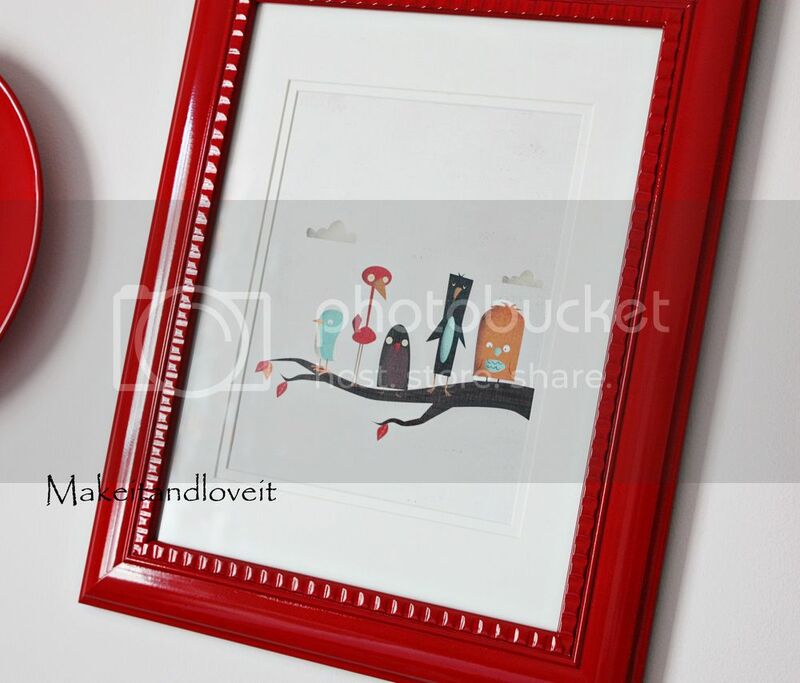 While that project was stewing………I spray painted a picture frame cherry red, so that I could use my Bird Branch print from Fall Down Tree. But the red on the frame was an exact match with my plates. So I quickly decided that the print was going to hang out in my room for a while. Maybe I’ll share it with my craft room in a few months. For now, I love that print. If you want your own Bird Branch print, click here. Or visit the entire Fall Down Tree shop on my left sidebar, or click here. As for the plates, I found some plate hangers at Pier One. They came in many sizes. But after I bought them and closely inspected them, I’m remembering that I have seen these same plate hangers at Hobby Lobby…..and I’m sure a variety of other places. (That center section is 2 springs, so it stretches and keeps the hooks snug around the plate. The little hooks show just a bit from the front, but keeps that little beauty in place. Have fun with those plates. And whatever else you match them with. that looks fabulous with your bed decor! oooooh loving it… im a fan of the reds myself! love the red, nice 'pop' of color! enjoy. oh red….sigh. I just love that color. Looks great. I bet that you could spray paint the hooks that are showing on the plate hangers and you would not be able to see them at all. 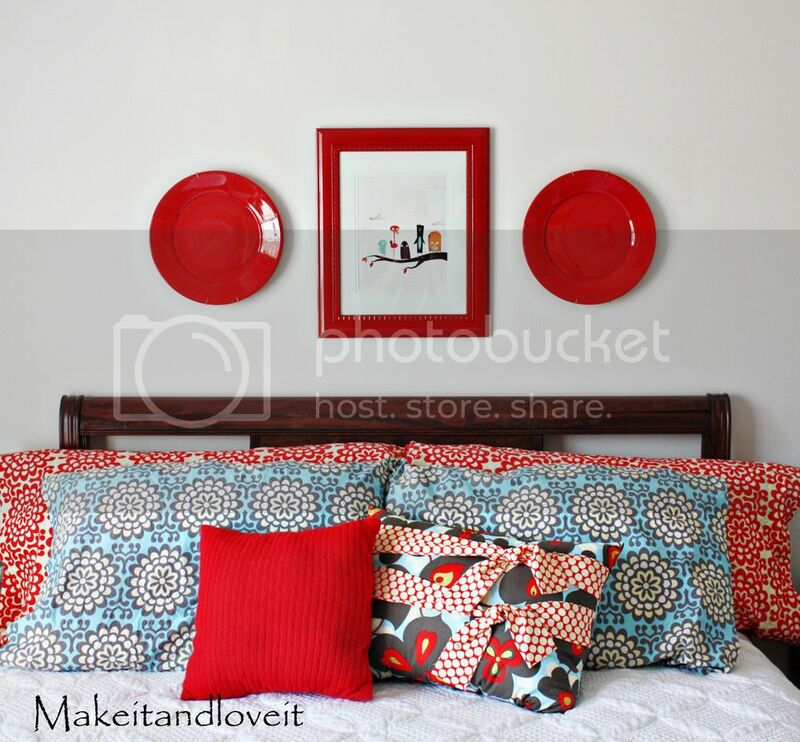 Love your bedroom colors & love the plates! Thanks for sharing how you hung the plates. I have seen some awesome plate hangers that don't show at all over at theletteredcottage.net (one of their sponsors on the sidebar-I THINK it is dischangers.com???) but nice to know I have another option when I hang plates in my kitchen. LOVE that red! And the print is a real keeper! Rosie over at 'Journey to Charm' posted with a splash of red in her kitchen! Red is delightful and charming, dontcha think?! I feel the need to spread some red now, lol! I love how plates look on the wall! I did something similar in my daughter's room (http://happybabydesigns.blogspot.com/2010/02/wall-decor.html). I LOVE the red! I heart it…I hope those are some super snug hangers tho! i sure would hate for that to come crashing down on your lovely noggin while snoozin…if you got smooshed I would have to call ya Smashlee. love ya…cheers! They look great with your pillows. great idea! they really pop! I just love your blog. Although I never used a sewing machine in my life, I was thinking about buying one this summer and start making my own little stuff. And hopefully this blog will inspire me to do so, because once I am a mother I would like to create outfits for my little ones ;). I like the top you did for your daughter. i have been keeping tabs on your decorating since the move and am quite impressed! i have 2 little ones too and can't seem to get anything done! love the white on the bed…you must not have black dogs! i am forever doomed to a life of dark fabrics on all surfaces that can be lazed on. i think the room looks fab and i'm keeping all these ideas you keep on coming up with in my "future room decor when i finally move" file. thanks! oh my this is just to die! i love everything in this post! you are so creative! Beautiful! I love Amy Butler! Her fabrics are my therapy! Hey Ashley- Just wondering what red spray paint you used on the frame? I am looking for that shiny bright red to paint frames too and your's is perfect!Thank you!! My address is emilyelewis@yahoo.com. I'm so happy to see that you put plates on your wall! So do I but it seems no one else does and I've been wondering if it was an outdated design idea. But now I feel much better because you did it, and it looks awesome! Thanks for the pillow tutorials. I've put them to use!